Show Them Some Love! - A Digital Marketing Agency | IIAS - International Internet Advertising Services Inc.
Show them some love! Valentine’s Day is a great reminder to think about ways you can show your customers how much you value them. A little appreciation goes a long way in building solid, long term relationships which means repeat business and word of mouth referrals. Here are a few ideas to get you started. Every demographic on the planet loves free stuff! Find a product you can put your logo and website address on and send them to your top 100 clients. If you send invoices to entrepreneurs or small businesses, pick one customer a month and give them a discount on something they’ve already purchased at the regular price. Add a personal note saying how much you appreciate their business. Quite a few restaurants offer a free meal on your birthday, and you can do something similar, or hold a special sale on the birthday of one of your staff. “George in accounting is turning 50 on Friday. If you drop by to wish him a Happy Birthday, we’ll give you $50 off your next purchase of $200 or more.” You could also have customers email a birthday wish and reply back with a coupon. This strategy hits a few different aspects of relationship building, and gives customers the feeling that they are part of the family. 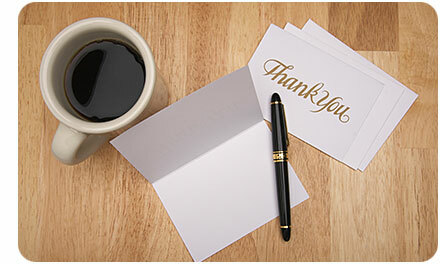 When was the last time you got a Thank You card in the mail – I mean the old fashioned, Canada Post, stamp on an envelope? It will cost you a couple of bucks, but will make a big impression. So, here’s our offer of appreciation! Send us your promotion to add to our newsletter. Write up to 200 words promoting your products and services, then email in to [email protected] along with your logo and some high quality photos. Please put “offer of appreciation” in the subject of your email so we can look for it. We’ll add your business to our March newsletter. We like to hear from you and we love to promote you. 2015 Rules of Engagement: Get Real, Get Personal, Get Mobile 6 Ways to add Some Sizzle to Your Summer!